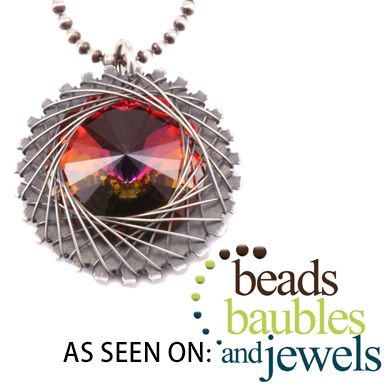 Instructor Taryn McCabe teaches you how to create this beautiful pendant using washers, nuts and bolts, and a Swarovski crystal stone. This smart and stunning cold connection setting will be a wonderful addition to your jewelry collection. 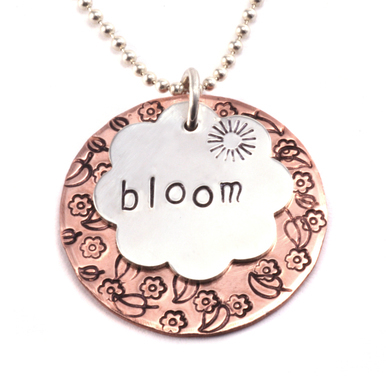 This is an intermediate level class, we recommend you have an understanding of Stamping on Metal before getting started with the stamping portion of this project. Jump Rings -you'll need 2, 4mm I.D. 18 gauge. These videos are so well thought out! I love how you can see the breakdown of what you watched and what is up next! Beaducation covers all the details. I am SO glad I found your site! Thank you! This was my first project with Beaducation. It allowed me to frame a French coin that held great meaning for me and turned it into a lovely pendant. Have used the technique on other items as well, all successful thanks to this great class. Beaducation is the Best! Instant gratification, lovely and fun! Beaducation's Instructor really helped to make this happen...Thanks a Million! I can't wait to make this project! I've ordered the bolts and wrenches. I have some rather small oval cabochons that will make beautiful pendants so I will saw my own washers and use this technique. Taryn you are a great instructor. Thank you for another super video! This is so nice. I love the design and the DIY video. Beautiful work.